As part of our celebration of National Poetry Month, we're featuring the work of a wide variety of poets. Today's poet is Fleda Brown! Born in 1944 in Columbia, Missouri, Brown grew up in Fayetteville, Arkansas. After earning her doctorate in English from the University of Arkansas, in 1978 she took a position at the University of Delaware, where, she created the Poets in the Schools program, which introduced children in local schools to poetry with the help of graduate student poets. She continued to manage this program for more than a decade, in addition to her work as a teacher, guest lecturer, and, of course, poet. Her first book of poetry, Fishing with Blood, was published in 1988, followed by Do Not Peel The Birches in 1993. In 2001, she was appointed the Poet Laureate of Delaware, a position she retained until her retirement from the University of Delaware in 2007. 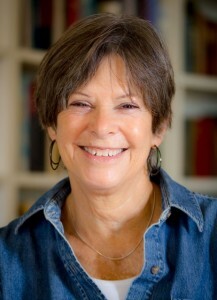 After her retirement, Brown and her husband moved to Traverse City, Michigan, where she continues to write and give readings of her poetry. Her 2007 collection, Reunion, was awarded the Felix Pollak Prize in Poetry, and her latest, The Woods Are on Fire: New and Selected Poems, was just released in March. She also continues to teach, both locally and with the Rainier Writing Workshop, a low-residency MFA program at Pacific Lutheran University in Tacoma, Washington. You can hear Fleda Brown regularly on Interlochen Public Radio, and she's a familiar face here at Brilliant Books as well. We've been privileged to host readings of her work and even a launch party for her book No Need of Sympathy. Stop in to browse her work; if you're lucky, you may even get to meet the author!